Fast and secure Xvast browser | DRM Digital Rights Management Protect Content PDF, Protect MP4, Protect WebM, Protect MP3, Protect WAV. 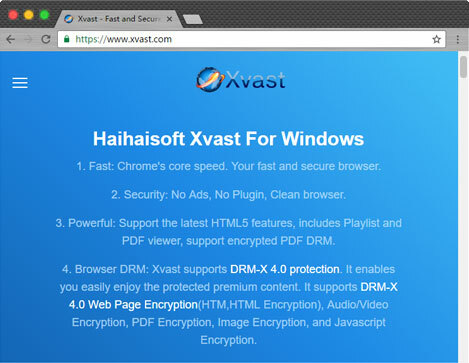 Xvast is the latest high-speed and secure DRM browser from Haihaisoft. It supports browsing web pages, playing high-definition video online or offline, reading PDF documents, downloading files, and it is a cross-platform browser supporting both Windows, MacOS, iOS and Android. Xvast has playlist feature and supports keyboard shortcuts. Xvast browser is based-on latest Chrome core. Its support all the latest HTML5 standards. 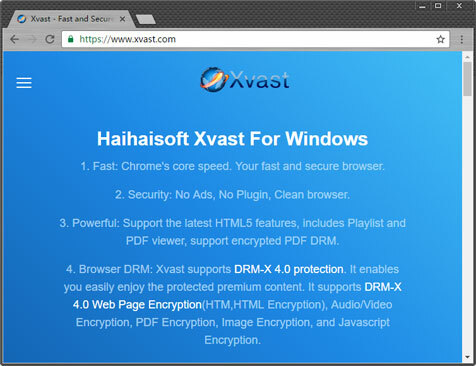 Haihaisoft makes Xvast browser more secure based-on Google Chrome. All the protected files can be securely opened in Xvast both (streaming online and open it in local computer or device in Xvast), and the rights permission of files can be totally controlled by Content Providers in DRM-X 4.0 platform. Such as Begin Date, Expiration Date, Expiration after First Use, Play Count, Dynamic Watermark, Disable Virtual Machine (like VMWare), Blacklist, License combined with hardware, and so on. Xvast for Windows is based-on latest Chrome core. It’s the fast, secure, ad-free, plug-in-free browser that supports the latest HTML5 standard, supports playlist feature and PDF browser. You can play online and locally play audio/video files and open PDF files protected by DRM-X 4.0. Xvast for Mac is a fast, secure browser with powerful features, its support all the latest HTML5 standards, built-in high speed PDF reader, support for opening DRM-X 4.0 encrypted MP3 audio, WebM video, MP4 video, PDF e-book web page content. Xvast for Android is an extremely fast DRM browser that supports smooth streaming of audio and video, and saves power. It supports playback of DRM-X 4.0 encrypted audio/video and PDF files on Android devices. Built-in audio and video playlist feature, support browsing open audio/video and PDF files in the Android devices. Xvast for iOS, it’s a web browser based-on Apple’s WebView, it includes media player and PDF reader. Currently, it supports DRM-X 4.0 encrypted mp3, mp4, and PDF files. 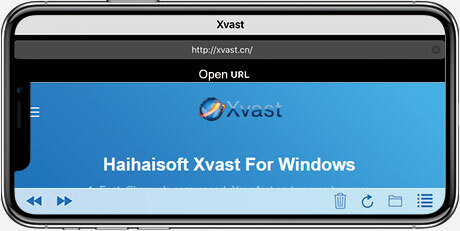 Your customer only need to install one Xvast app to open both protected audio/video and PDF files. When Xvast detects that there is an embedded Video tag in the web page (the ID needs to be named xvast_player), it will prompt the user whether to play the video in the webpage, and it is more convenient to implement online playback. When playing audio and video, it supports different playback rate. Xvast iOS, it includes fast PDF reader within itself. It supports outline, reflow, links, search PDF, and check Licenses. Your customers can also synchronize protected files from iTunes to devices through File Sharing.